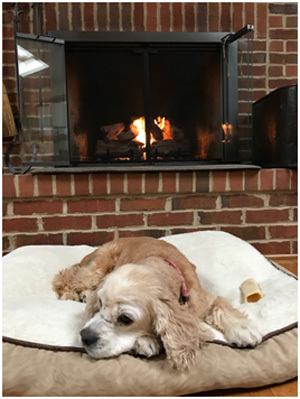 Izzy [Adoption Pending] is an 11 year old, female buff cocker who came to the rescue as a private surrender and has been with our family for the past three months. She is very sweet, loves attention from humans, and gets along well with our 3 cockers as well as dogs visiting our home. Izzy adjusted well to our routine. She is house trained and crate trained, staying in a crate while we are out of the house as well as during the night. She enjoys going on walks, and when awake, likes to be wherever we are. 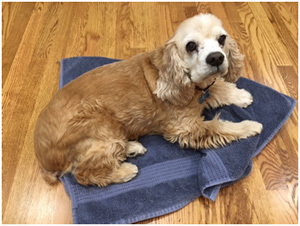 Being 11, Izzy has a mild heart murmur, and her hearing is not what it used to be. She is very attentive visually, so she will follow us around and pick up clues as to what to do. However, when she is sleeping, she is not aware of anything, and needs to be gently nudged to be awakened. Her favorite place to sleep is in a basket full of blankets! She loves to use the doggy stairs to get into her basket!